For decades it seemed clear that EC competition law was enforceable effectively at the national level, and ECJ case law has continued to bear this out. In recent years, however, the Commission has been proposing harmonization of national rules of procedure in competition cases, implying that procedural autonomy is insufficient on its own to produce an effective enforcement system in this area. As the authors of this book clearly demonstrate, this suggests a binary system governing the enforcement of EC Articles 81 and 82: namely, that led by the Commission through directives and eventual regulations, and that built on ECJ principles in areas not dealt with by such Community instruments. This book describes and analyzes not only the specific Commission recommendations, but also the manner and extent to which these recommendations are or may be implemented in civil procedure. 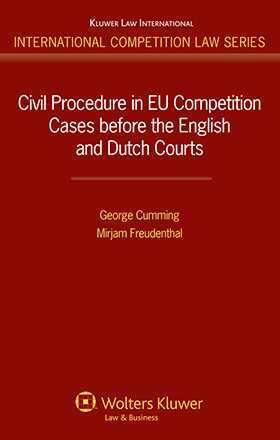 In particular, the authors consider changes which may be required if these recommendations are incorporated into Dutch and English rules of civil procedure. Also addressed are elements of procedure not mentioned by the Commission but which might usefully be considered in the context of ECJ principles of effectiveness, equivalence and effective judicial protection of rights. At the heart of the study is a detailed analysis of the Commission White Paper on Damages Actions and the Commission Staff Working Paper, both issued early in 2009. Anticipating as it does a looming impasse in European competition law, this remarkable book sheds defining light on the real implications of EC competition law for parties to damages actions, not only in the national systems studied but for all Member States. For practitioners and jurists it offers a particularly useful approach to the handling of cases involving European competition law, and also serves as a guide to current trends and as a clarification of doctrine. Preface. Introduction. 1. Analysis of the Principles of the White Paper on Damages Actions. 2. The Recommendations Made by the Commission in the White Paper. 3. Private Enforcement of the European Law of Competition in Dutch Civil Procedure and Civil Law. 4. English Civil Procedure and the White Paper Recommendations. 5. Conclusion. Bibliography. Annex: White paper on Damages Actions for Breach of the EC Antitrust Rules. Green Paper on Damages Actions for Breach of the EC Antitrust Rules.